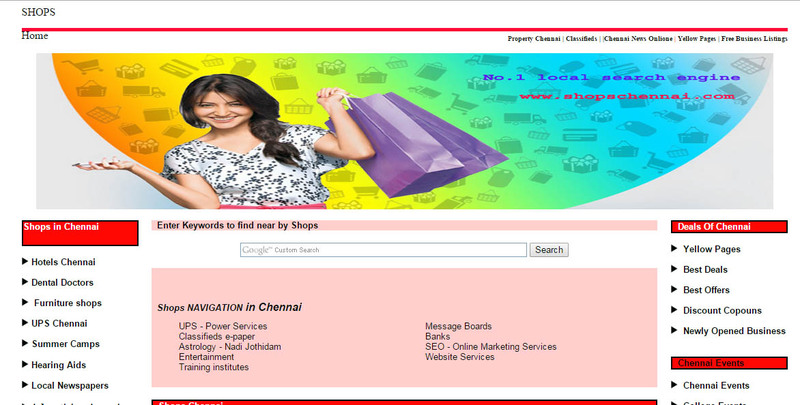 Shops Chennai’s No.1 local search engine provides comprehensive updated information on all B2B and B2C Products and Services. Services available in all major Areas cities including Kodambakkm, Annanagar, Vadapalani, Porur, Chennai, Tambaram, Chrompet, Ashoknagar Tnagar, Kodambakkam, Mylapore, Mugappair , Velachery and many more. who we are ? This website is developed and maintained by Times Media, Publishers from 2012, group of local newspapers published in Chennai, T nagar Times, Pillar Times, Ashok Nagar Times, , Pillar Times, Chrompet Times, Pammal Times,Arcot Road Talk, Selaiyur Times The Metro Connect, Trendy Talk wekly newspapers. ADVT Options : All our advertisers in our group newspapers will be listed in this website with a dedicated webpage to show cast there business, services, in Online. We also given option to others those who have not placed advt with us in the form of free listings. For more advt options please contact us at 084281 82676 or timeslocalnewspaper@gmail.com. CALL US NOW OR E_MAIL US TO PROMOTE YOUR BUSINESS IN ONLINE.